Now citizens of smart city Bhubaneswar can order cooked temple prasad and ‘Abhada Bhog’ online and get it delivered at their doorstep at click of the mouse. Six Bhubaneswar-based techies have come up with a startup, ‘Temple Thali’ that procures ‘Abhada’ from temples and delivers it to people. The venture was started recently. On the menu are ‘Normal Abhada’, ‘Special Abhada’, ‘Temple Thali’ and special ‘Khaja’. While the ‘Normal Abhada’ includes Anna, Dal, Besara, Saga, Khata and Kheer, the ‘Special Abhada’ has Kanika, Dal, Khata, Besara, Saga and Kheer at Rs 110 and Rs 130 respectively. 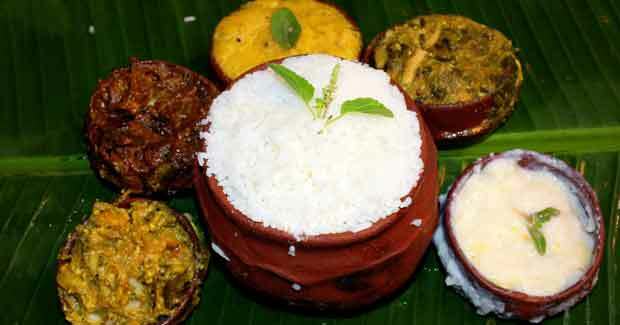 At present, Abhada Bhog is procured from the Ananda Bazaar of Ananta Basudev temple in Old Town, Bhubaneswar. Similarly, the ‘Temple Thali’ includes Anna, Dal, Vegetable Curry, Khata and Kheer and is priced at Rs 70. Temple Prasad is procured from the kitchen of Shani temple at Vani Vihar, Bhubaneswar. ‘Khaja’, a sweet delicacy in the list of confectionaries under ‘Sukhila Bhog’ for Lord Jagannath, is procured from Puri. A packet of 12 pieces of big size Khaja is priced at Rs 100. The startup was the brainchild of a group of friends from College of Engineering and Technology (CET), Bhubaneswar. The venture has its own delivery mechanism that includes a group of delivery boys. After an order is confirmed, they pick up the Prasad packed hygienically in traditional earthen pots from the temples and deliver it at various places. Currently, the service is limited to Bhubaneswar. People can places orders for lunch before 10 am on any given day through their website, Facebook page, Whatsapp and also through an Android app (TempleThali).